"That MAC gun can put a round clean through a Covenant capital ship." 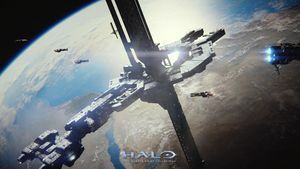 An orbital defense platform (ODP), also known as an orbital weapon platform, is a class of large UNSC space stations used to defend locations of great importance, typically planets of a high strategic value. They have the hull classification symbol of OWP. Orbital defense platforms are frequently placed in geosynchronous orbit and deployed in groups, or clusters, of two to five platforms. The well-equipped and large bridge of an ODP is suitable for directing large-scale engagements. Such was the case when Fleet Admiral Sir Terrence Hood directed UNSC forces from an ODP during the Battle of Earth. These platforms are capable of destroying even the largest of Covenant capital ships but are vulnerable to Covenant boarding craft which can avoid the heavy slugs and latch onto the stations. Thus, it is up to the UNSC personnel within the stations to repel any boarders. Internally, the stations are remarkably spacious, complete with high ceilings and a monorail system to move personnel and equipment. In addition to numerous small craft bays, there are two docks for larger ships, such as freighters, or even frigates. These docking bays could possibly be used to hold Longsword fighters used to protect the station from hostile spacecraft. The design incorporates many features against potential hostile boarding action, including security stations and small arms racks situated at strategic locations. The primary and crucial armament is a Mk. V "Super" Magnetic Accelerator Cannon capable of causing near-fatal damage to even a shielded Covenant capital warship with a single slug. The slug can weigh up to 3,000 tons and is launched at 4% the speed of light,[note 1] ensuring the complete annihilation of the ODP's target. As with starship-mounted MACs, a platform's cannon is commonly controlled by an AI. Due to the immense power of the MAC, a large recoil dampening system is situated at the base of the cannon. Additionally, the platforms are armed with a number of point-defense guns for close-in defense against enemy munitions, fighters, and boarding craft. ODPs do not possess the power generation equipment necessary to fire their main armament. Instead, they receive power from ground-based generators. An effective strategy to neutralize the formidable ODPs would be to disable the generators via ground assault. This would disable the platform's weaponry without destroying it, allowing this valuable prize to be captured or destroyed outright. The Covenant used this strategy during their invasion of Reach, dropping troops to the planet's surface and destroying these generators. This paved the way for Covenant forces to completely overwhelm the UNSC forces in the space battle over Reach. An ODP above Reach firing its main cannon. By August 2552, Reach was protected by twenty ODPs. At least one of these platforms was in place by May 2517; a number were online by 2527. During the Fall of Reach, the orbital defense platforms inflicted massive losses on the Covenant armada in the opening stages of the battle, as well as providing fire support for ground forces on Reach. Large numbers of UNSC forces were deployed to protect the orbital platforms' planetside power generators, but they ultimately fell against determined enemy assaults. The disabling of the defense platforms was a major factor on the battle's outcome. The outbreak of the Human-Covenant War prompted a massive expansion of Earth's defenses. Even as late as the Battle of Reach preparations had not yet been completed; a series of new platforms above Earth were set to come online on September 14. By October 2552, some 300 ODPs were operational. Many of Earth's ODPs were named after points of interest that they roughly kept station over. A portion of the 300 platforms first saw action at the early stages of the Battle of Earth. Athens Station and Malta Station were each destroyed by antimatter charges installed by Covenant boarding parties, while Cairo Station only narrowly avoided the same fate as the other platforms thanks to Master Chief's removal of the bomb on board. The ODPs were used throughout the drawn-out Battle of Earth after Truth's fleet arrived, but the Covenant might have already destroyed numerous stations when Truth himself arrived at Earth on the Forerunner Dreadnought in November. During the Didact's attack on Earth in mid-2557, ODPs defended Earth from the Didact alongside the ships of the UNSC Home Fleet. However, the Didact's ship Mantle's Approach was too heavily shielded for even the ODPs Super MACs and as a result, the Master Chief had to destroy the ship from the inside with a HAVOK nuclear warhead. The MJOLNIR GEN2 Infiltrator was tested on New Carthage's orbital defense platforms. Several orbital defense platforms were stationed around Camber; these were eventually destroyed when the Covenant destroyed the planet during the Human-Covenant War. Several orbital defense platforms held station above the Outer Colony of Meridian, owing to the world's critical importance as an industrial supplier of the UNSC; these stations were lost to the Covenant during the Battle of Meridian in 2551. This element includes a single ODP. Fighter Cover: Only Interceptors can be selected by MAC platforms. Bombers are not available. Vital Defensive Asset: A maximum of two MAC platforms per full 1,000 points are permitted. All known orbital defense platforms over Earth are named after cities on Earth. It is also apparent that the stations' names are also based roughly on the region they orbit above: Cairo, Athens, and Malta, for example, are located rather close to each other geographically. However, the stations' locations do not directly correspond to the planetside locations of the cities, as the other stations in Cairo's battle cluster can easily be seen with the naked eye, whereas their namesakes are hundreds of kilometers apart. The fact that there are 300 ODPs orbiting Earth could be a reference to the Battle of Thermopylae, in which 300 Spartans used the phalanx formation to hold their own against an army of more than 200,000 Persians. Two weeks after the Fall of Reach, when the UNSC Security Council met at HIGHCOM in Sydney, it is mentioned by Colonel Ackerson that most of Earth's ODPs would take ten days before becoming fully operational. The kinetic energy of a single shell from an orbital defense platform would be equivalent to almost 51.6 gigatons of TNT, 1,031 times the yield of the real world's largest nuclear weapon currently tested. The orbital defense platforms had entered the conceptual stage sometime around the 2490s, as Avery Johnson mentions that they were being proposed around the same time he shipped out for boot camp. Concept art of an ODP's fighter launch bay Halo 2. Concept art of an M12 Force Application Vehicle in an ODP's interior airlock. Concept art of an ODP's interior airlock. Concept art of an ODP's weaponry controls. Cairo Station's battle cluster above Earth, one of the dozens of triads in the orbital defense grid. Cutout of Cairo Station in Halo 2. The typical layout of an ODP. Cairo Station right before the Battle of Earth. Nassau Station firing its MAC in Halo: Uprising. An orbital defense platform above Reach, along with the Epsilon Eridani Defense Fleet in Halo: Fall of Reach. An ODP, as shown in one of Halo: Combat Evolved Anniversary's Terminals. An ODP shown in orbit above Earth. Oaxaca Station in 2558 in Halo: Escalation. Cairo Station with docked In Amber Clad from Halo 2: Anniversary. The underside of a Super MAC platform. The dampening system at the base of an ODP's MAC. Cairo Station firing its MAC. ODPs firing at a Covenant fleet in the Halo 2 Anniversary Terminals. Orbital MACs in Halo: Fleet Battles. Model of the orbital MAC platforms for Halo: Fleet Battles. An ODP in the vicinity of a newly awakened Guardian above Earth in Halo 5: Guardians. Several ODPs in Earth orbit as the Infinity and her escorts approach the Guardian. ↑ While the Halo Encyclopedia lists the velocity as 40% the speed of light, the figure remains unchanged in the reissue of The Fall of Reach, a more recent source.